When contacted on the discovery, confronted with the facts, Mr. Supo Atobatele, NAMA spokesman, denied the existence of the stretch limos, claiming that NAMA is a “professional agency” that provides navigational aid to aircrafts flying within Nigeria's airspace. 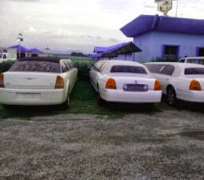 Sahara Reporters obtained the photos of the Limousines, which were parked at the headquarters of the Total Radar Coverage of Nigeria (TRACON) grounds in Abuja. NAMA's CEO, Nnamdi Udo, reportedly made the purchase and 'donation' of the Tundras to the Minister in June 2013. The four Limousines were received in the third week of June but have never been put to use.